Filing bankruptcy today is very common and more accepted in society. VA and FHA Loans are the only two loan program that allows borrowers to qualify for home loans during Chapter 13 Bankruptcy repayment plan and there is no waiting period after discharge. Bankruptcy is a consumer’s right to protect themselves by creditors and gives them a chance of discharging their debts and/or reorganizing their finances. It is a federal law. Bankruptcy is not the end of the world. Actually, it is the opposite. It gives consumers a fresh start in life. Consumers can start re-establishing their credit right after their bankruptcy discharge. According to a New York Federal Reserve Bank study, consumers filing bankruptcy often learn from their past debt problems and are better off after their discharge. As consumers add credit tradelines such as secured credit cards, this will expedite the increase of credit scores. Chapter 7 Bankruptcy is also called total liquidation. Borrowers without jobs or reduced income with little to no assets can qualify for Chapter 7 Bankruptcy. Home buyers can qualify for home loans after Chapter 7 bankruptcy after meeting the mandatory meeting period. Home buyers can qualify for FHA and VA Loans during and after Chapter 13 bankruptcy. 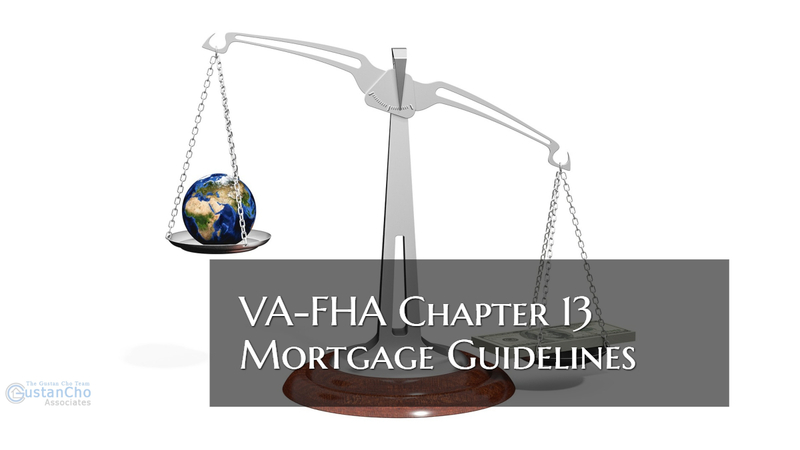 VA-FHA Chapter 13 Mortgage Guidelines are exactly the same. Not too many lenders will do a manual underwrite on VA and/or FHA Loans. Gustan Cho Associates at Loan Cabin Inc. are one of the very few national lenders that does manual underwriting on VA-FHA Home Loans. Borrowers who need to qualify for VA-FHA Chapter 13 Mortgage Loans with a direct lender with no overlays on government and conventional loans, please contact us at Gustan Cho Associates at 262-716-8151 or text us for faster response. Or email us at gcho@loancabin.com. We are available 7 days a week, evenings, weekends, and holidays.